Situated on a spectacular 100 ft x 270 ft lot on a highly sought after street in Lorne Park, this Legend Homes built 5,000 sq ft haven features an outstanding South facing backyard retreat with an in-ground salt water pool, mature landscaping, and extensive stone work all surrounded by lofty trees and substantial wooded areas. 1554 Jalna Avenue was designed to accommodate both informal gatherings as well as more formal gatherings. On the formal side, the dramatic oval shaped foyer with two-storey height ceiling is sure to impress your most discerning guests. Decorative glass doors flank both sides of the foyer, leading to the formal dining room on your right side, and an elegant home office or study on the left side. Walk-through the foyer, and enter into a formal living room with glass French doors framing views of the covered terrace and back garden. Just off the formal living room is a quiet den, with access to the covered terrace. The perfect space to retreat to after dinner or enjoy coffee on a sunny morning. There are two powder rooms and two walk-in coat closets on the main floor ready to accommodate both formal and informal areas. 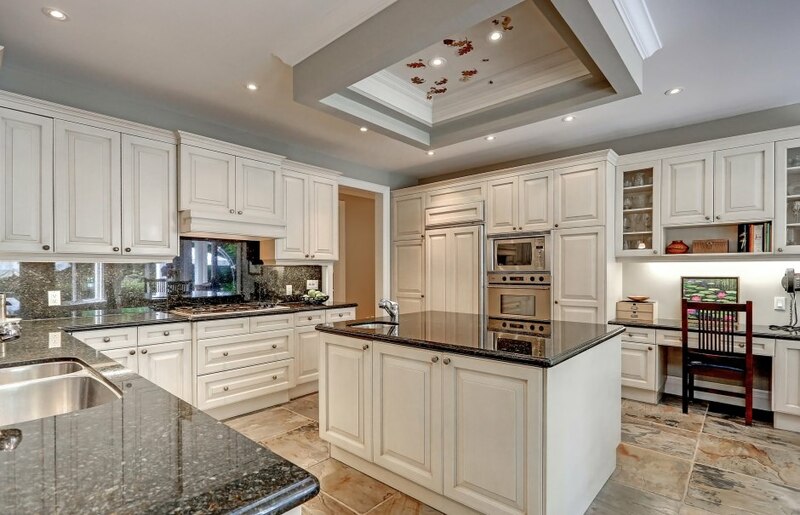 On the less formal, but equally spectacular side, the beautifully designed Downsview kitchen opens to a grand family room with two-story vaulted ceiling, fireplace, and media centre. This combined open concept space is ideal for large get-togethers with family and friends, providing lots of areas for seating, cooking, visiting, and socializing. There is also convenient direct access to the covered terrace, backyard grounds and in-ground pool. The second floor boasts four spacious bedrooms, each with their own private ensuites and ample closet space. 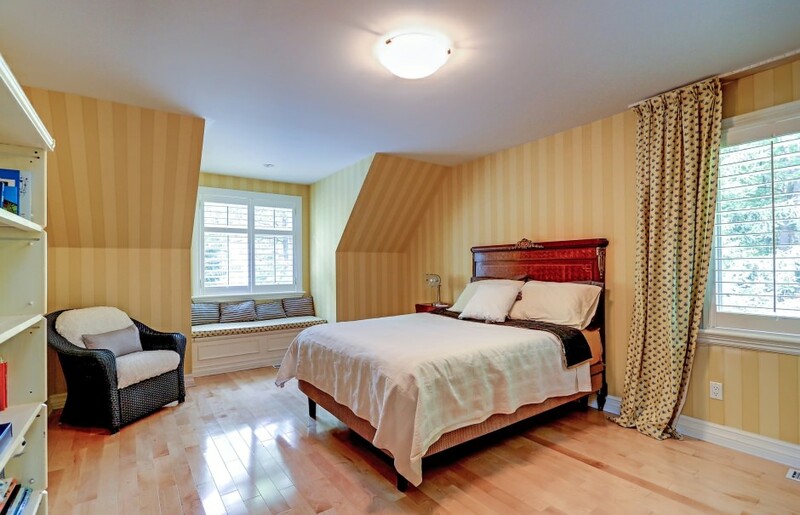 Each of the three front bedrooms feature maple hardwood flooring and a large dormer window with built-in window seat. 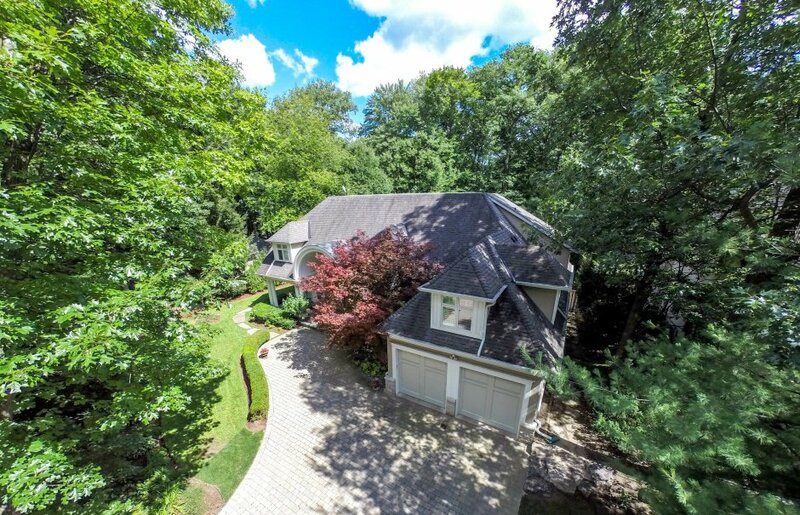 The Master Bedroom is bright and sunny with a cathedral ceiling and large windows taking advantage of back garden views, mature trees and evergreens. A sitting area overlooking the gardens has a glass fireplace adding ambiance to the room. There are two walk-in closets in the Master Bedroom, as well as a luxurious spa-like master bath with two vanities, an oversized walk-in shower and a Jacuzzi tub. The lower level is professionally finished top to bottom, adding an extra 3,000 sq ft of living space to the home. Games and recreation areas, a media room, a wine cellar, a built-in bar equipped with fridge and prep sink and plenty of storage space. The magnificent grounds on this outstanding property are truly memorable and admirable with each change in season. Professionally landscaped with an assortment of shrubbery, evergreens and perennials, set against the backdrop of towering century old trees gives the feeling of being at a luxurious Muskoka retreat all year round. No shortage of space or comforts in this impressive modern home. 1554 Jalna Avenue is a well maintained home built for those who appreciate luxury and comfort at home. Canada's 6th largest city is a cosmopolitan and vibrant jewel in the Golden Horseshoe's crown. A preferred destination for many who desire to live in the bedroom community to Toronto. With its close proximity to Pearson International Airport and a highly efficient transit system, this wonderful executive community boasts a wide varaiety of lifestyle living choices... from luxury condos to exclusive and private lakefront neighbourhoods. Fortunately, every resident gets to enjoy the natural spectacle of Lake Ontario thanks to the city's mandate of accessible lakefront for all. Quaint historic villages, world class art venues and theatres, and some of the area's finest golf courses can be found here.